Jim Corbett is the oldest park and known for many adventurous wildlife activities like riverside camping, river rafting, angling, jungle safari, fishing, bird watching, etc. 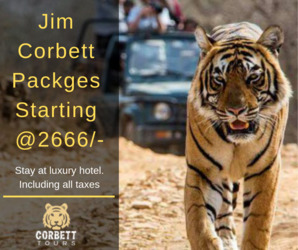 and if your are also planning to explore the adventure in jim corbett hire us and let us plan your customized tour package.We take care of your travel arrangements, hotel bookings, sightseeing, comfort and other necessary things to make your trip one of the best. We specialize in creating amazing tour packages for small, mid sized as well as large groups that too at very much affordable price.